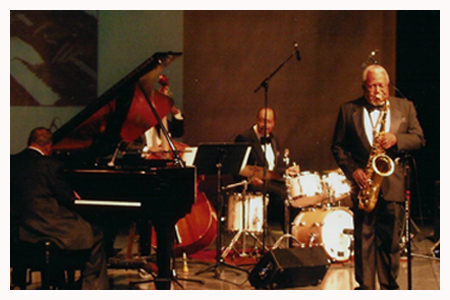 Rusty Tucker pounds the skins with Alaadeen (saxophone) and Jay McShann (piano) at a 2005 Gem Theater performance. Rusty Tucker was a fixture of the Kansas City jazz scene for more than 50 years. He could be found playing his trumpet with others or sitting behind a drum kit for the Scamps. Tucker died almost four years ago, but I was priviledged to speak with him in his Independence, Mo. home in 2002 when I was a reporter for The Examiner. Here is Rusty’s story.